OBJECTIVE: Oxidative stress (OS) has been implicated in the aetiology and progression of diabetic complications including diabetic foot ulcer. 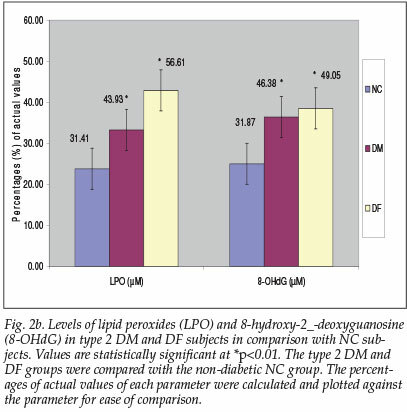 In this study, the levels of lipid peroxides (LPO) and 8-hydroxy-2'-deoxyguanosine (8-OHdG) as well as the enzymatic antioxidant activities of superoxide dismutase (SOD) and glutathione peroxidase (GPx) in type 2 diabetes mellitus and diabetic foot ulcer subjects were assessed and compared with apparently healthy normal subjects to understand the involvement of OS in the subjects. METHOD: The abovementioned OS markers were measured in 50 subjects for each of the following groups: type 2 diabetes mellitus (DM), diabetic foot ulcer (DF) and non-diabetic control (NC). RESULTS: Significant elevated values of LPO (39.86%) and 8-OHdG (45.53%) were found in DM subjects compared with the NC subjects. This increase in both parameters was greater for DF subjects: 80.23% and 53.91% respectively. SOD activities were significantly reduced in DM (14.82%) and DF (4.09%) subjects in contrast with elevated activities of GPx observed in DM (21.87%) and DF (20.94%) subjects. 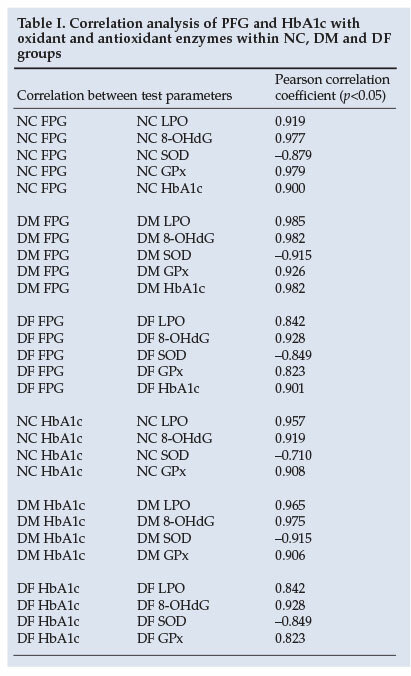 Glycated haemoglobin/fasting plasma glucose (HbA1c/FPG) correlated positively with LPO, 8-OHdG and GPx, whereas a negative correlation was observed for SOD. CONCLUSION: Increased oxidation subsequent to diabetic conditions induces an over-expression of GPx activity suggesting a compensatory mechanism by the body to prevent further tissue damage in the subjects. The present investigation was carried out to assess the levels of lipid peroxides (LPO) (a marker of lipid peroxidation) and 8-hydroxy-2'-deoxyguanosine (8-OHdG) (a marker of DNA damage), as well as the enzymatic antioxidant activities of superoxide dismutase (SOD) and glutathione peroxidase (GPx) in normal control (NC) type 2 diabetes mellitus (DM) and diabetic foot ulcer (DF) subjects, to understand the involvement of OS in diabetic foot ulcers. The study population comprised 50 type 2 DM subjects and 50 DF subjects with Wagner's grade II ulcer classification (i.e. ulcer without abscess or osteomyelitis). Males and non-pregnant/non-lactating females between the ages of 40 and 60 years with HbAlc >6.5% were recruited from the medical ward of University College Hospital, Ibadan, Nigeria, as 'test' groups. In addition, 50 age-matched healthy non-diabetic subjects of both genders with HbAlc <6.5% were selected as a normal control group from among the staff of the same university. Informed consent was sought and obtained from each subject before recruitment into this study, which was approved by the Ethical Committee of the University of Ibadan and the University College Hospital Institutional Review Committee (UI/UCH IRC) (approval number UI/ IRC/03/0096). Ten-millilitre aliquots of venous blood drawn after a 10-hour overnight fast were collected in heparinised EDTA or fluoride sample tubes and centrifuged at 3 000 rpm for 10 minutes. Plasma and haemolysate were stored at -80°C until the day of analysis. Antioxidant enzymes (SOD, GPx) were measured in heparinised whole blood, whereas oxidative status parameters (LPO, 8-OHdG) were assessed in EDTA plasma. Fasting plasma glucose (FPG) and glycated haemoglobin A1c (HbAlc) were measured in plasma from sodium fluoride and EDTA samples respectively, on the day of collection using standard laboratory techniques. Chemical reagents of the highest quality were purchased from Sigma-Aldrich, Germany. LPO concentrations were measured spectrophotometrically at 560 nm using the ferrous oxidation with xylenol orange (FOX VERSION II) assay according to the method of Nourooz-Zadeh et al.5 This method is based on the principle of rapid peroxide-mediated oxidation of Fe2+ to Fe3+ under acidic conditions. Erythrocyte SOD activity was determined by the method of Arthur and Boyne,7 using a commercial kit obtained from Randox Laboratories, UK. This method uses xanthine and xanthine oxidase (XOD) to generate superoxide radicals which react with 2-(4-iodophenyl)-3-(4-nitrophenol)-5-phenyltetrazolium chloride (INT) to form a red formazan dye. SOD activity is then measured by the degree of inhibition of this reaction spectrophotometrically at 505 nm. The determination of erythrocyte GPx activity was based on modification of the method of Paglia and Valentine,8 using a commercial kit obtained from Randox Laboratories, UK. This method involves the oxidation of glutathione (GSH) by cumene hydroperoxide catalysed by GPx. In the presence of glutathione reductase (GR) and NADPH, the oxidised glutathione (GSSG) is immediately converted to the reduced form with a concomitant oxidation of NADPH to NADP+. The decrease in absorbance is then measured spectrophotometrically at 340 nm. All data were presented as mean ± standard deviation (SD) for 50 subjects in each group. The Statistical Package for Social Sciences (SPSS) (version 13) was used for statistical evaluation. Significance of differences was determined using one-way analysis of variance (ANOVA). Pearson's correlation coefficient was determined within groups. Statistical significance was set at p-values <0.05. Pearson's correlation analysis of all the groups revealed a strong correlation of FPG and HbAlc with LPO, 8-OHdG and GPx, in contrast to a negative correlation with SOD. As expected, NC-HbAlc correlated positively with NC-FPG (r=0.899). This correlation became stronger in the DM and DF groups, with a correlation coefficient of 0.982 and 0.901 respectively, as shown in Table I (p<0.05). 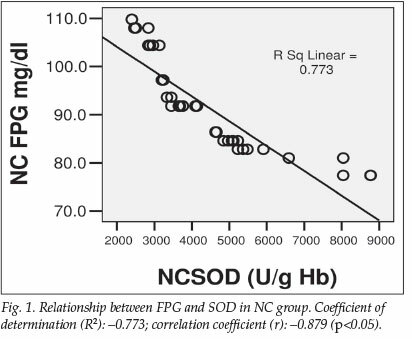 The negative correlation between FPG and SOD (r=-0.879) in the NC group is shown in Fig. 1. 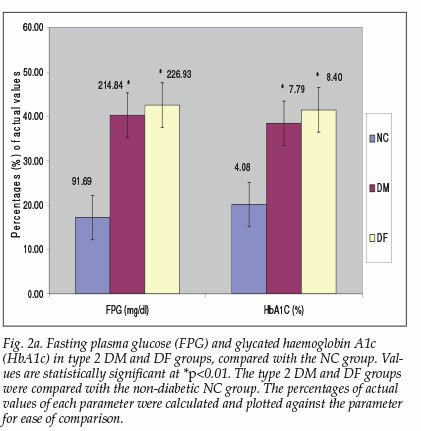 The mean values of FPG and HbA1c were respectively 214.84±65.26 mg/dl and 7.97±2.55% for the DM group. For the DF group, they were 226.93±127.10 mg/dl and 8.40±1.91% respectively, compared with 91.69±9.56 mg/dl and 4.08±0.75% for the NC group, as shown in Fig. 2a. A high level of LPO was observed in the plasma of the DF group (56.61±17.34 µM), compared with the DM group (43.93±16.46 uM) and NC group (31.41±15.95 uM). The extent of oxidation was reflected in the concentration of DNA adduct, 8-OHdG: 49.05±13.79 uM and 46.38±18.03 µM, corresponding to an increase of 53.91% and 45.53% respectively for the DF and DM groups, compared with the NC group (31.87±11.58 uM) (Fig. 2b). 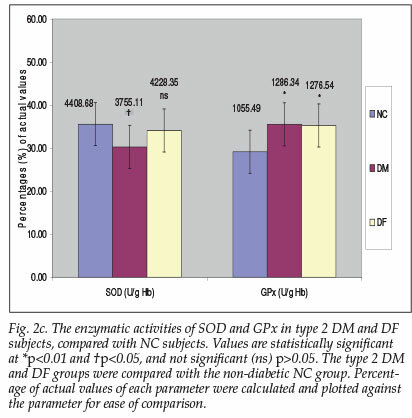 A slight increase in GPx activity was observed in the DM and DF groups (21.87% and 20.94% respectively) in contrast with a substantial decrease in SOD activity in the DF (4.09%) and especially in the DM group with a decrease of 14.82% (p<0.05) (Fig. 2c). In this study, a high level of HbA1c and FPG was found in both type 2 DM and DF groups, with the latter group having a greater increase as a consequence of poorly controlled glycaemia in these subjects. The correlation coefficient results obtained in this study revealed a strong association between these two parameters (FPG and HbA1c) and the level of oxidants and the activity of antioxidant enzymes in diabetic subjects with and without foot ulcers as well as non-diabetic subjects. One of the characteristic features of chronic diabetes is lipid peroxidation resulting from excessive reactions of free radicals with polyunsaturated fatty acids (PUFAs) in cell membranes. This lipid peroxidation in turn leads to elevated production of free radicals.10 Lipid peroxide-mediated damage has been observed in both types of DM. We have indeed confirmed in our study the findings of Santini et al.11 on the increase of plasma LPO levels in diabetic subjects, compared with those of control subjects. In addition to these observations, a substantially elevated level of this parameter was found in DF subjects, which may be due to their increased production of ROS. As with other biomolecules, deoxyribonucleic acid (DNA) is also susceptible to damage induced by free radicals. An elevated level of 8-OHdG (a marker used for assessing the extent of DNA oxidative damage by free radicals3) was indeed observed in type 2 DM and DF subjects (45.53% and 53.91% respectively), compared with the NC group. This finding is in agreement with the study by Dandona et al.,12 who reported greater oxidative damage to DNA with more increased generation of ROS in both type 1 and type 2 DM patients than normal controls. In addition, heterogeneous results of unchanged,14 decreased15 or elevated16 activity of erythrocyte GPx have been reported. In this study, a significantly elevated GPx activity was observed in DM (21.87%) and DF subjects (20.94%), compared with the NC subjects. These findings accord with the work of Gupta and Chari16 in both types of diabetes, where an increase was also reported. The increase in the activity of this alternative antioxidant enzyme may constitute a compensatory mechanism to prevent further tissue damage in diabetic subjects. Findings in this study are compatible with the hypothesis that persistent hyperglycaemia leads to increased production of oxidants (LPO and 8-OHdG) in diabetic subjects. The increase is more pronounced in subjects with DF. Increased oxidation subsequent to diabetic conditions induces an over-expression of GPx activity, suggesting a compensatory mechanism by the body to prevent further tissue damage in such subjects. We gratefully acknowledge the financial support of Third World Organization for Women in Sciences (TWOWS) and the technical assistance of the Chemical Pathology Department of the National Health Laboratory Services (NHLS) of South Africa.